Available at FigmentsStudio. I will definitely be buying at least one, eventually, despite the high prices. 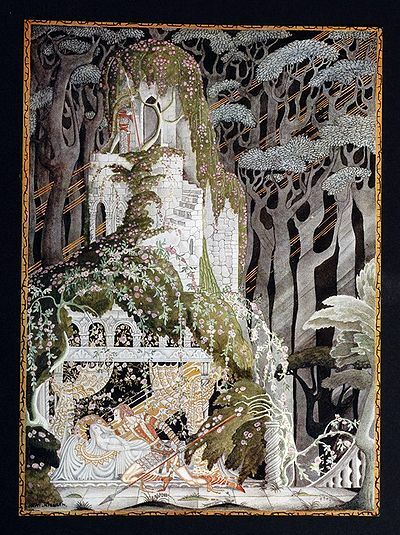 Kay Nielsen, 1886-1957, was a Danish illustrator of fairy tales. 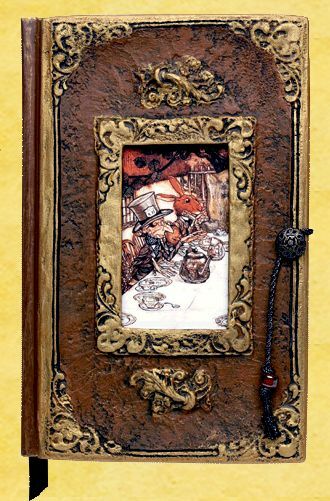 I have to admit, before I started blogging I didn't think too much about fairy tale illustrators and only knew the artists of a few of the most famous illustrations of Beauty and the Beast. 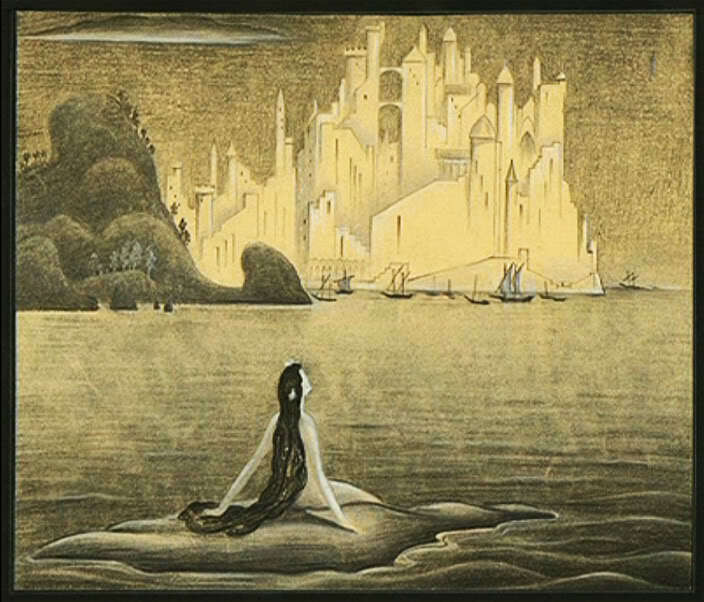 But since looking for images to accompany posts, I've discovered several artists I really love, one of them being Kay Nielsen. I totally assumed Kay would be a girl, but you pronounce it "Kigh," and he was a man. 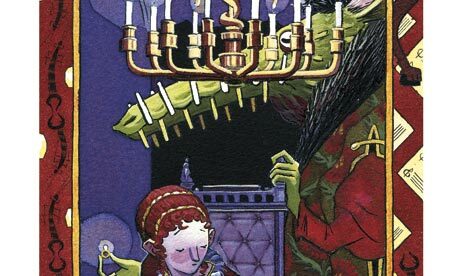 I was curious as to what led him to illustrate mainly fairy tale scenes, but it seems he just happened to receive commissions to illustrate fairy tales. 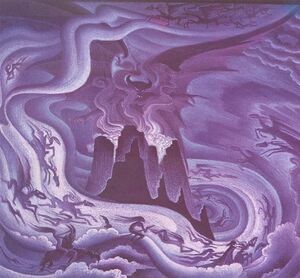 "Nielsen's designs were featured in the "Ave Maria" and "Night on Bald Mountain" sequences of Fantasia, but in 1940 he was laid off. He was brought back to work on designs for a Fantasia sequel that was discontinued after the disappointing showing of the original at the box office. He did some drawings for a version of The Little Mermaid, a film that had to wait almost 50 years to be made. Nielsen was given a posthumous screen credit as one of the designers"
Bruno Bettelheim is a very interesting figure whose work involves two of my passions-fairy tales and people with disabilities-specifically, autism. 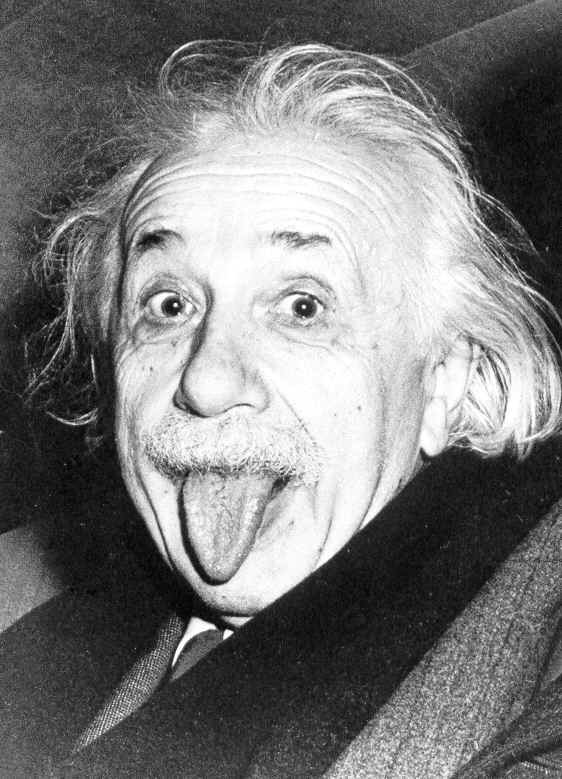 He spent part of his life in a concentration camp, but went on to become well known for his work in child psychology and Freudian psychology. His contributions to understandings of autism are less than helpful. He believed autism was the result of poor parenting. As part of the therapy, he had the children stomp on figures of their mothers and hurl insults at them. His work in fairy tales was perhaps slightly more beneficial. His book The Uses of Enchantment was very popular at the time, so even if Freudian psychology grates on you after a while, it's worth a read just to see how it's influenced current thought in interpreting fairy tales. He was very pro-fairy tales, so he still gets quoted a lot. He believed fairy tales help children sort through their various stages of development. He lobbied for what he thought were the perfected versions of tales-such as the brothers Grimm-because oral tales told over and over again are shaped to nurture whatever the child's needs are. He must not have been aware that the Grimms' versions were hardly authoritative, and to call them "oral" tales is doubtful. His characters sort through Oedipal difficulties. This isn't too hard a stretch for the abundance of fairy tales with female protagonists, evil mothers and absent fathers. He also interprets Hansel and Gretel as children who were stuck too long in their oral stage and had to move on. Their rushing to eat a house of candy has nothing to do with the fact that the children are starving to death-literally-and only their oral greed (intentional sarcasm here on my part). Beauty and the Beast is a tale of a young woman who transfers her Oedipal attatchments from her father to a mate in a healthy way. Donkeyskin is not a tale about the potential evil of fathers, but a young girl's fantasies that her father will become sexually obsessed with her, and so on. However, there are many very interesting points he makes as well, so again, it's worth a read. According to his own theories, Bettelheim should have been the most self-actualized person ever, because of all his readings of fairy tales, but he suffered from depression and committed suicide in 1990. A Rusalka is a Slavonic female water nymph, or ghost. She haunts watery places and will lure men, and sometimes children, to their deaths. She will use singing or sometimes laughter to entice the men, and baskets of fruit for the children. Sometimes she would even tickle them to death. Czech composer Dvorak wrote an opera entitled Rusalka, first performed in 1901. The libretto, written by Czech poet Jvaroslav Kvapil, is basically a different version of Undine or The Little Mermaid. Rusalka, the daughter of a Water-Goblin, falls in love with a man. She sings her song to the moon, asking the moon to tell the man of her love. This solo is very famous and a personal favorite of mine. The witch Jezibaba tells her that, once human, if the Prince of her affections ever betrays her, they will both be eternally damned. Rusalka will also lose her power of speech when human. 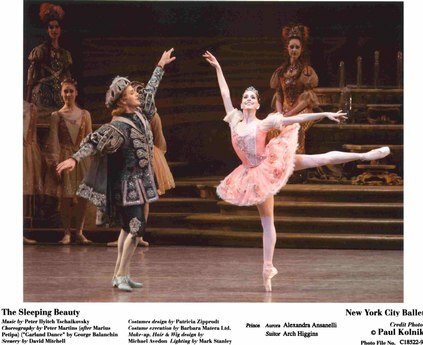 A foreign princess is enough to lure the Prince away from Rusalka, and she goes to the witch for advice. 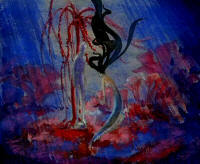 She is given a dagger and told that, if she kills the Prince, she can be saved. Rusalka throws the dagger in the lake and becomes a bludicka, a lake spirit which only emerges to lure humans to their death. The Prince later comes to the lake she haunts and senses her. He asks her to kiss him, though he knows it will destroy him. She does; he dies, and she goes back to being a water demon. There seem to be two kinds of books about Disney: those produced by the Disney company to promote their image and sell their products, and those by outsiders who set out to "expose" Disney to be a misogynist, racist, money-making villain who carefully created a false image for the public. David Koenig is a refreshing read, because he's not affiliated with Disney but is still a fan who manages to take an honest look at the movies. For each movie, Koenig gives the "recipe" that went into making the movie: The Original Tale, then the Disney Version. He describes the different phases the script went through-why certain elements were altered from the original version. He also describes Plot Holes he sees that don't quite make sense, and the Bloopers. The scenes the animators planned but got left out of the movie are in the Cutting Room Floor section. 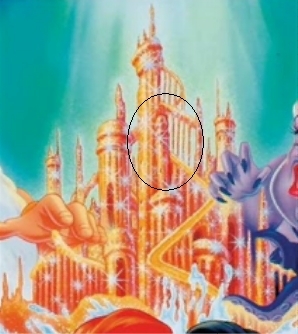 Hidden Images describe secret little jokes (some of them not-so-secret) the animators put in frames of the movies, from hidden Mickeys to phallic images in a tower of Triton's castle. In Strange Reactions, Koenig reports how the audience responded to the movie when it came out. You'd be surprised at how powerful cencorship boards were, back in the day (especially in Europe). Lastly, Koenig traces those movies that inspired Attraction Offspring at one of the Disney theme parks, and why or why not they succeeded. There was too much fascinating trivia to share here, other than telling you to go read the book yourself. But one thing that I found interesting that relates to issues previously discussed on the blog: some of Disney's harshest criticisms are against the passive female heroines of the earliest Princess movies. Also pretty damning is the racism in Song of the South. Aware of the racial controversy surrounding Song of the South, Disney hired Maurice Rapf to work with writer Dalton Reymond because of his progressive views. Rapf's version of the script would have appeased many a modern fan, as he made the African Americans more independant. However, Reymond and Rapf didn't get along, and Reymond was assigned a new partner. Rapf's positive story changes went out the window. Rapf was then assigned to Cinderella. He didn't like the idea of Cinderella being passively bossed around all day, either. He suggested a scene in which one day, "they're ordering her around and she throws the stuff back at them. She revolts, so they lock her up in the attic. I don't think anyone took (my idea) very seriously." Ahead of his time. One more thing-remember how I secretly think Peter Pan is the villain and Captain Hook a victim of circumstances? Well Rapf didn't like Peter Pan either! He says, "I made Peter Pan a villain. He doesn't want anybody to grow up and that's dangerous, the temptation not to grow up. So I had Wendy tell him off." I like this Rapf guy, too bad he had so little influence. Quick recap: Madame de Villeneuve's story of Beauty and the Beast is the closest we have to any sort of "original" or "authoritative" version, published in France in 1740. In it she provides extensive descriptions of what Beauty does each day in the castle, as well as backstories for both the Beast and Beauty. I'm taking these details from Jack Zipes' translation. The Prince was raised by his widowed mother and her friend, a fairy, who could be controlling and manipulative. When an invading army forced his mother to lead the troops to battle, the Prince was left with the fairy. She educated him, but one day left him for a while. When she returned, she realized he had grown quite attractive. She gave him romantic attentions, of which he was oblivious for a while, until she made known her aims, fully expecting joy and gratitude at the proposal. 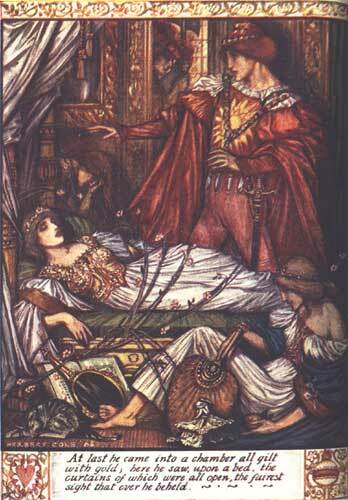 The Prince was young and had no desire to marry an old, ugly, and haughty fairy, but feared her ill will. He begged to wait until he could obtain his mother's permission. They travelled to the battlefield where his mother was fighting. The Prince led his people to victory, and afterwards the fairy told the Queen of her proposal. The Queen was shocked, and the Prince refused the offer. The fairy was enraged and could not comprehend why anyone would be insulted to have her as a lover. The Queen, unwisely, suggested that the fairy "Look at the people reflected by this mirror without any bias...and it will speak for me." The fairy took this to mean that the queen was vain because of her son's beauty. She gave the Prince a blow on the head, and when he tried to get up, the weight of his body was unusually heavy and he could not lift himself-he had been transformed. The fairy also added, "and since intelligence isn't necessary when one is so handsome, I command you to seem as stupid as you are hideous." The conditions for breaking the spell are set: only when a beautiful girl comes to seek him of her own will, though convinced he would devour her, and later agree to marry him, could the spell be broken. The Queen is forbidden to reveal the Beast's true identity to anyone. 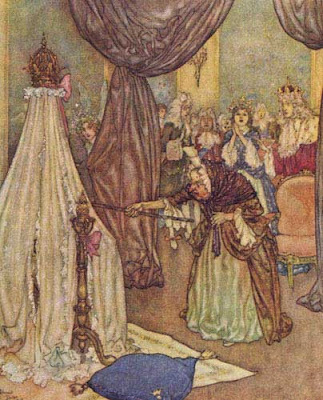 The Queen's pleading has no effect on the fairy, who leaves after mocking the Beast's condition ("You won't have long to wait, for such a darling will undoubtedly soon find a way to remedy his misfortune"). 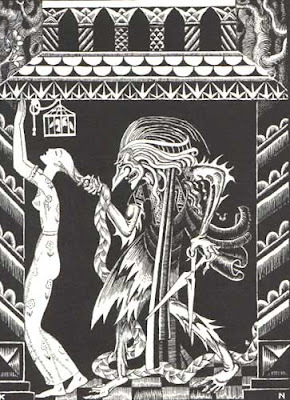 The Queen and son are on the verge of committing suicide when another fairy appears to them, chiding them for their cowardice and assuring them that "there is no evil that cannot be overcome with time and courage." She promises she will do all in her power to find the woman who can break the spell. 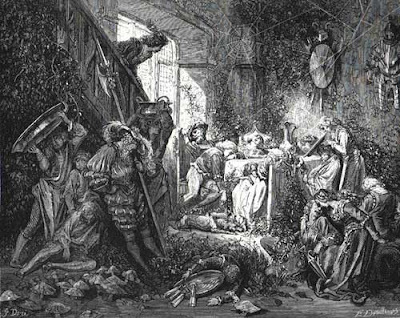 To avoid scandal, or someone betraying the conditions of the spell, she transformed all the living beings in the castle into a statue and surrounded the castle with thick fog so that only appointed guests could find the castle (rather like the sleeping people and thorns that protect the castle in Sleeping Beauty). The Queen was sent to a different castle, and the good fairy provided the Beast with entertainments before leaving to work on his behalf. 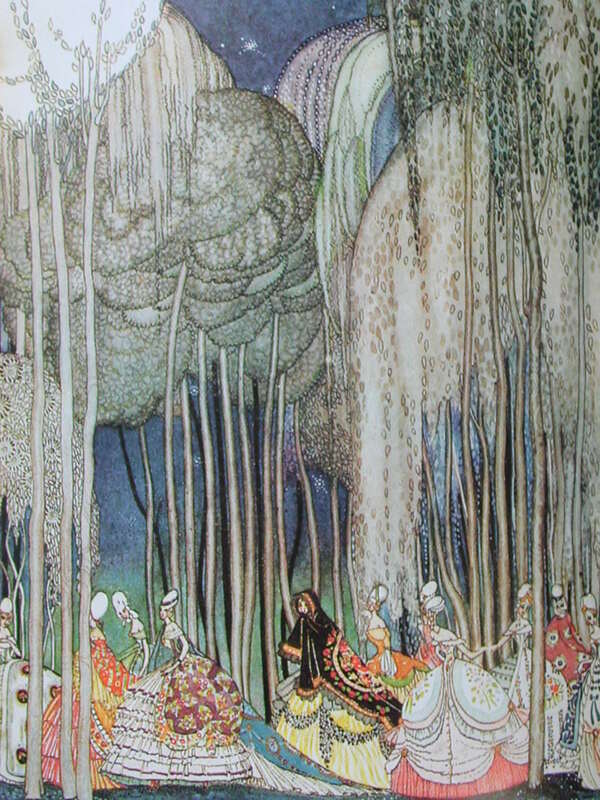 The fairy comes and goes with news of the Prince's mother, and one day tells him of a coming traveler, whose daughter the fairy planned to have break the spell. In order for the terms of the counterspell to be followed correctly, the fairy instructs the beast to threaten the father with his life unless one of his daughters comes in his place. This he does, and the rest is history. Part 1 of Muppets in Disney World. A 1990 film not available unless you taped it off tv. "It was basically﻿ made to promote Disney's impending acquisition of the Muppets, which is why Mickey says "welcome to the family," but the deal fell through after Henson's death. " Responding to a discussion about Disney's "Wish Upon a Star" vs. the Muppets' "Rainbow Connection:"
"Obviously they're joking about the "philosophy" line [this comes in part 6], but I've always thought that Rainbow Connection was a really profound philosophical song! And much more beautiful than When You Wish Upon a Star, which it even gently criticizes in its lyrics ("Who said that every wish would be heard and answered when wished on the morning star? Somebody thought of that, and someone believed it:﻿ and look what it's done so far...")." I have to admit, as an unabashed Disney fan as I am, I do NOT like the lyrics to Wish Upon a Star, or the fact that that has become the Disney theme song. "Fate is kind/She gives to those who love/The sweet fulfillment of/Their secret longings"...this would be very nice, if it were at all true, but I believe in never lying to children. Sometimes wishes come true, sometimes they don't. Now, this will be of no interest for anyone unless you grew up watching it, or have young kids to show it to...but my siblings and I LOVED this and I totally still watch it before any time I go to Disneyland, and I may or may not work out to it...only 47 more days till I go!!! Earliest influence-"Perceforest," French romance from 1528, which has similar elements-mainly a girl getting raped in her sleep. -Talia is not cursed by a bad fairy, just had a bad horoscope. -The young king thought to check back on his hot, unconcious lover and finds her alive and with his twins. They fall in love. Problem: he's married. His wife orders the children to be cooked, but the kindly cook hid the children. -The Queen is about to burn Talia. She cries while removing her clothing and the King hears and comes. The King has the Queen burned instead and is about to burn the cook (thinking he had eaten his own children) but the cook brings out the children and is spared. -Takeaway lesson: "And of course he married Talia, who lived a long and happy life with her husband and children, always knowing full well that "The person who is favored by fortune has good luck even while sleeping." "
Perrault-"Sleeping Beauty"-from Histoires ou Cont du temps passe, 1697. Online version available here. -The passing prince hears of the tales and enters the castle. He doesn't actually kiss her, just happens to be there the moment the hundred years are over. They were married that night. -The prince kept the marriage a secret. Again he fathers two children, Dawn and Day. -The cannibalism attempt on the children and rescue by cook is repeated, but this time by the ogre mother-in-law. The Queen's fate is to be eaten as well. -Ogre mom hears Day crying one day after she thought she had eaten them. Furious, she sets up a huge vat to be filled with vipers, toads, and all kinds of horrible animals, to kill the Queen and her children. The Prince returns home just in time to throw his mother in instead. -Note: details of plot and choreography will differ from company to company. So the ballet version is more malleable, more like the original oral versions, than the set-in-stone literary versions listed here. Indian mythology is intertwined with Hindu beliefs. Indian epic poems "are some of the oldest epic poetry ever created and some works form the basis of Hindu scripture" (from wikipedia), unlike Western fairy tales, which existed before the spread of Christianity, and when Christianity came, some tellers of tales infused the newer Christian theology into the older fairy tales. Although, apparantly the Hindu tales were also revised a bit for the sake of religion. In a 1928 book from my library, Washburn Hopkins retells some of these ancient stories. He says, "I have endeavored to tell the tale as I conceive it to have been before it was tampered with, to remove the priestly interpretation and re-interpret the story as it should have descended to us, with the emotional implications (suppressed by the priests) intact." I am not familiar with the other versions of these stories (or if modern scholars agree with Hopkins' claims), but the ones Hopkins tells are retold beautifully. Here I am going to relate excerpts of his tale "Ganges" (also known as Ganga). And all the gods rejoiced in her whenever she passed by. She was so happy in her heart she never could be still. She had no time for other things, but all her life was play. And chase the little wandering starts that always got away." 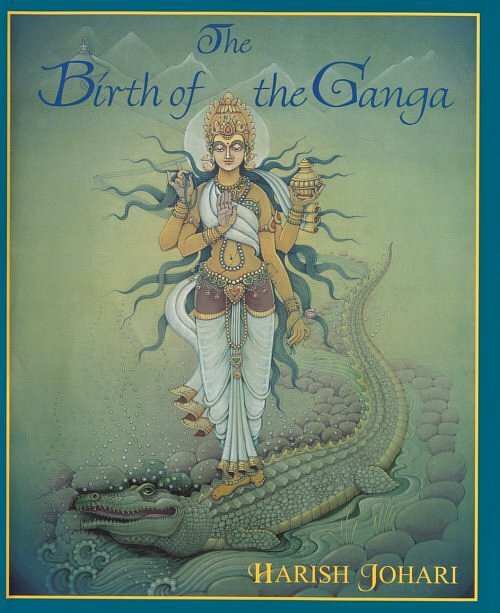 One day Ganges comes to the door of heaven, from where she can look down and see earth. But when she does she is stricken to see the sufferings of the people down below. She became sorrowful; Ganges was sad." The other gods find Ganges and attempt to distract her. "Turn thy face from earth, dear, turn thy head and smile. We from thee have hid the truth but ah, so short a while! Which all the gods concealed from thee. We would not make it known"
The gods go on to explain that the earth is in draught and they cannot do anything to help, because Fate has ruled that until a god leaves heaven and gives up their life for the sake of man, the ocean will continue to dry. None of them could imagine giving their lives for the humans, but after considering the matter, Ganges decided she would be the one to make the sacrifice. Ganges, fair Ganges, stood at heaven's high door. She felt a wonder of great joy that flooded all her breast. And straight before the tearful gods sprang headlong from the sky. Leaped to earth to show to mortals how a heart divine may love. And all sins shall be forgiven him that bathes in Ganges' tide." One thing I miss about old cartoons is how perfectly married the music is to the animation. Nowdays we have great movie soundtracks, but generally the music just sets the overall "mood." Here, in Cinderella, every single movement on the screen is illustrated by the music. This is the Spanish version, but it was the only clip I could find of just this scene, which has such great descriptive music. 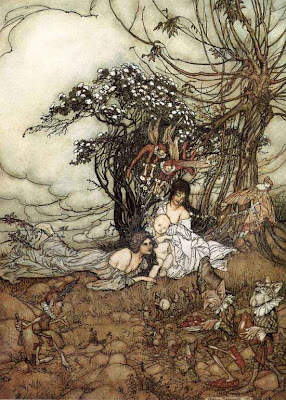 Modern people may be surprised to find how fervently fairy lore was believed up until relatively recently. Even this year, supposedly a builder lost 15,000 pounds because locals wouldn't let him disturb a rock under which fairies lived (read here). But the most awful, heartbreaking results of fairy beliefs are those having to do with changelings. A changeling is a fairy or stock (wooden figure) made to exactly resemble a human and left in their place, while the real human is abducted and taken to the land of fairies. Fairies most often take children, either to raise or to make work as slaves, or young women to be servants, midwives, or wives. 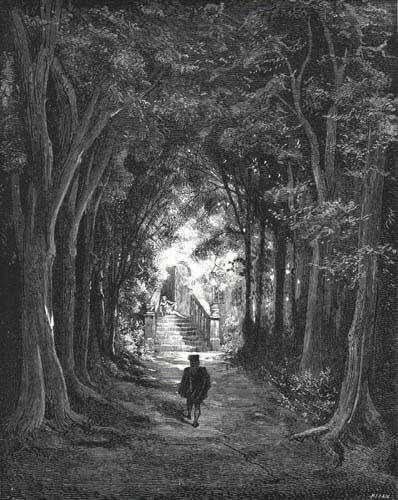 Many people never return to the land of humans, although some stories relate successful rescues of the fairy captives. Some remedies for changelings are harmless and humorous, such as cooking food in an eggshell. This will cause the changeling to burst out laughing, and (if the changeling was in the form of a baby), betray what he/she really is because it takes intelligence to find it humorous. Other remedies include leaving the changeling out, or holding them on a shovel over a fire. Ostensibly, the fairies will not want one of their kind to suffer, and will replace the changeling with the original. In Carole G. Silver's Strange and Secret Peoples, she has a whole chapter devoted to changelings. She cites a sickeningly long list of crimes related to claims that the victim was believed to be a changeling. 1826- Anne Rocke killed four-year-old Michael Leahy, who could not walk, stand, or speak, by bathing him three times in icy waters. The boy drowned. 1843-John Trevelyan of Penzance placed son on tree for several hours at Christmastime. Later ordered servants to beat, kick, and starve him. May 19, 1884-Ellen Cushion and Anastasia Rourke arrested for placing three year old Philip Dillon on a hot shovel. He had no limbs, was suspected to be a changeling, and severely burned. Not only is this shocking to anyone, but as a special educator this strikes a special chord with me. Those who were suspected of being changelings had some kind of physical deformity or mental disability that would lead people to suspect that they must be of another species. Scientists speculate the types of disabilities we now know of that coincided to "signs" of changelings, including spina bifida, cystic fibrosis, cerebral palsy, William's syndrome, Hurler's syndrome, and Hunter's syndrome. Some of my students have the above disabilities. One wonders if the criminals listed above were really glad of an excuse to get rid of their charges, or if they truly believed they were doing what was best for their loved one. It's frightening to think that these cases are only the recorded ones-how many more people were tortured or killed, unbeknownst to us? 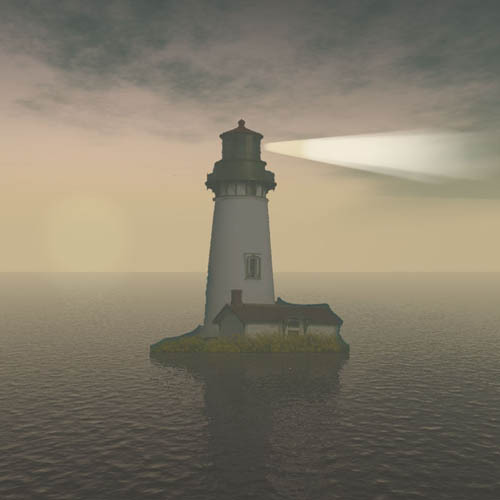 "The Lighthouse" is a short story started by Edgar Allan Poe. His death left it unfinished, and it has since been given an ending by author Robert Bloch (writer of the novel Psycho that inspired Hitchcock's film). 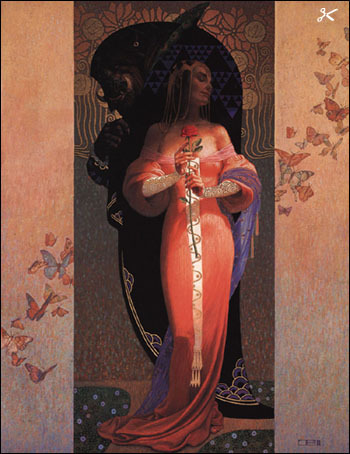 I found it in a collection of fantasy stories, not expecting to find a fairy tale connection, but the parallels to Beauty and the Beast were very interesting. The main character has started a job as a lighthouse attendant, for an entire year, in a completely secluded location. At first he relishes the chance to be alone, but soon the complete isolation gets to him. I always take note of descriptions of isolation in stories, because that's one aspect of the Beast that always fascinates me. What is it like for him to be cut off from civilization, alone in a castle with unrealistic hopes as his only comfort? What does he do until Beauty comes? Then the narrator decides to try to focus all his mind and energy to create life to comfort him. The first attempt he makes is a rose. He spends his days in meditation, ridding his thoughts of all but a rose. Miraculously, he finds a blooming rose along the oceanic coast and brings it inside, where it lives far longer than it should. Only when he begins to focus his thoughts on another object does it wither. Only it does not leave behind a dried and withered rose, but a repulsive piece of seaweed. The narrator's next goal is loftier: the perfect woman. She will be his Companion, and as she is a product of his imagination, the woman of his dreams. Once again the experiment is successful-but after seeing the beautiful woman, she opens her mouth to reveal a set of vampire teeth. She is not a human woman, but a woman created from the sea. The narrator's dog jumps on her and kills her, leaving not a woman's corpse, but a "bloated, swollen obscenity of a thing long-drowned and dead, risen from slime and to that slime returning." A storm is upon the lighthouse, so fierce the narrator knows he won't survive. He secures his journal entries in a bottle around his dog's neck and waits to die, perhaps to join his Companion in the depths. Note: Poe only wrote the first three days' worth of journal entries for this story, so no one knows what ideas he had for the story. Basically, the premise of the story was Poe's and all that follows was Robert Bloch. I don't know if he was aware of the connections to the fairy tale, and it's not a well known story so I haven't heard of fairy tale enthusiasts referring to it as a version of Beauty and the Beast, but the isolated man-magical rose-arrival of woman could easily pass for a slightly twisted and morbid version of the fairy tale. Tomorrow I start my summer nannying job! I'm looking forward to it, but I'll be going from working part time to more than full time, so likely posting will slow down. 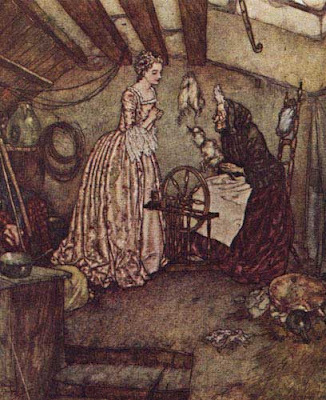 But in honor of this occasion we'll take a quick look at some famous fantastical nannies. In traditional folklore, there are hardly any nannies. The poor people of the tales could hardly afford to pay someone else to raise their children. Sometimes babies of royalty will have nurses, like the prince in the Russian tale who was told by his nurse of the most beautiful girl in the world, and set off to find her when he was only a few days old-but nannies in general are a relatively recent thing. So the more famous magical nannies are more recent. The movie Nanny McPhee is based on the Nurse Matilda books by Christianna Brand. I haven't read the books but love this movie-the actors (even the kids! ), the music, the magical scenery, the plot-it's just overall a quality family movie. But in a way it irks me that the only way Nanny McPhee can control the children is through her magic stick. If only I had that stick I could control any situation too, but I don't. 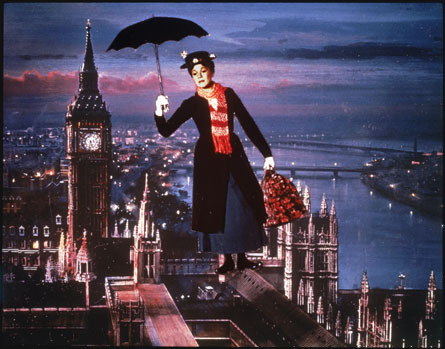 My ultimate nanny hero is Mary Poppins. She uses magic too, but I like to think that her magic is really just getting the kids to use their imagination. And talk about quality films-EVERYTHING about this movie is excellent. Also based on earlier books (the Mary Poppins series by P.L. Travers), many prefer the movie to the books (and I'm so glad Disney hasn't attempted to remake a more modern version of this movie-*shudder*). And just for fun...one of the best recut movie trailers is definitely Scary Mary Poppins. I referenced the movie Penelope in this post about the rarity of Animal Bride tales in our culture, and just came across my journal entry for the first time I saw the movie. Many of the issues in the movie are relevant to issues that are prominent in the interpretations and significance of Beauty and the Beast. "...I thought it was funny that her snout really isn't that bad, it certainly would never make people scream and run away from her. Stare rudely, talk about her behind her back, not date her, sure. I thought it funny too that people make a pig snout out to be hideous but no one mentions that the one guy's a little person. Making a point that men are allowed to be less than the perfect ideal and still taken seriously but not women? Probably not the intent but I think it's true. The snout may also symbolize how cruel people are to ugly women through exaggeration, or maybe how girls criticize themselves and in their minds a minor flaw is a grotesque thing. I'm probably analyzing too much. It did at least have a moral, more than most chick flicks. I was kind of hoping she would have to choose b/t marrying the jerk and losing the snout, or marrying James McAvoy and keeping the snout and she'd do that and they'd both live happily ever after. But beauty and the beast tales rarely end that way. As far as the love story itself went, modern movies try to create witty conversations and relationships so it's not love at first sight, but what ends up happening is so far from reality it might as well be love at first sight. They only have a couple of conversations over a couple days- maybe three-before they've both fallen in love with each other. What is it that attracts them to the other? He happens to steal the one book that's her favorite? 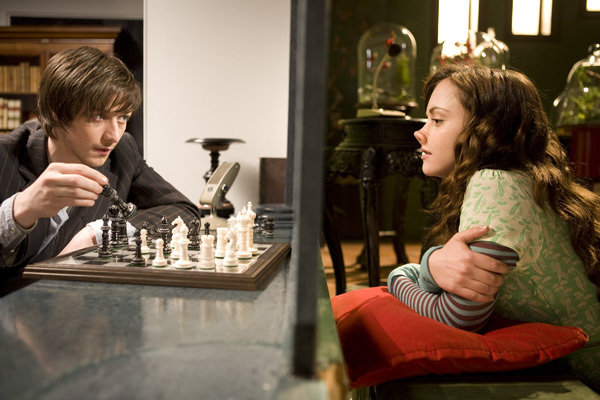 She happens to intuitively know that he'a musician and later that he plays the piano? So now we're supposed to look for psychic abilities in place of looks. I did like the whimsical scenery, the props, and music, and I can't be too harsh on it as it did try to tackle a very important theme and much needed message to our society. It was cute. I did find James McAvoy to be extremely attractive (although that's not supposed to matter...) and I do want Penelope's wardrobe. One more thing-I didn't like how the villain was all exaggerated and was afraid of Penelope and called her a monster. Men don't fear ugly women. I think a woman's worst fear isn't to be considered a monster, but simply to be insignificant. To be so ugly you don't matter; to not be taken seriously. I think more girls would connect with a character that's ignored and looked down on rather than run away from." Popular belief about elves is probably pretty similar to the opening montage of Elf (embedding disabled, sorry). Many authors have taken creative liberties with fairies, elves, and dwarves, but when you start to learn of traditional lore you see which authors probably had knowledge of it. J.M. Barrie completely invented the notion of fairies being born when a baby laughs and dying according to human disbelief, for example. And although Tolkein also creates his own signature world of races, it bears more resemblance to the worlds his ancestors would have assumed to be true. 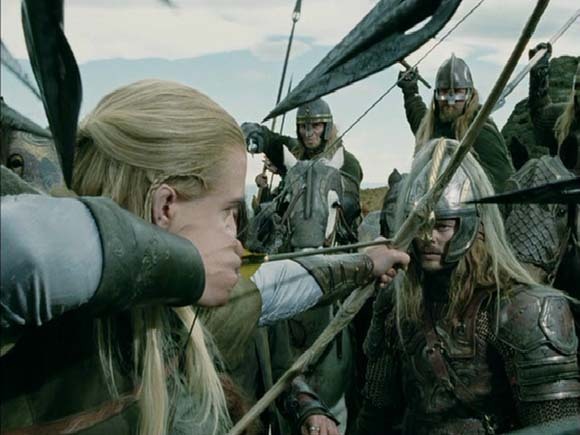 In the Lord of the Rings, each race uses its own weapons. Elves shoot arrows. 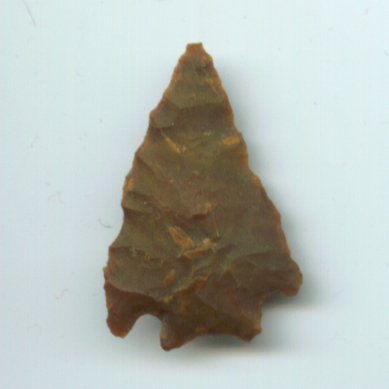 Long ago in England, arrowheads were assumed to be the weapons of elves, called elfshot. Tolkein's dwarves are known for working in mines. According to Katherine Briggs, "the smithy-work of these dwarfs...were famous from very ancient times, and a weapon or breast-plate forged by the dwarfs...was invincible against the work of any mortal smith" (p. 82, The Vanishing People: Fairy Lore and Legends). Tolkein's dwarves create astounding things, such as mithril, to which Frodo ends up owing his life. This song has nothing whatsoever to do with the fairy tale, but I like David Bowie so deal with it. According to wikipedia: "The lyrics have been interpreted as a look back at Bowie's severe mood swings during his cocaine addiction while living in Los Angeles from 1975 to 1976, with the line "Thank God Heaven left us standing on our feet" suggesting the singer's gratitude for making it through that period. The phrase "someone fetch a priest" alludes not to a desire for religious succour but to co-producer Tony Visconti's frequent expletive during the recording sessions for "Heroes", "someone f! @# a priest"." Bowie gives a hint to the choosing of the title in this video when he says it is "of somewhat schizophrenic nature." 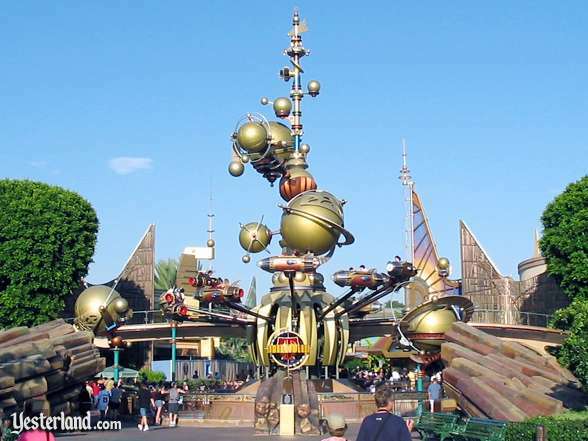 The Tomorrowland section at Disneyland was originally set in 1980 (the park opened in 1955). The whole thing is sort of a retro vision of the future, although of course Disneyland is continuously being revamped. Whenever we imagined the future, it involved huge advances in transportation methods and everyone wearing all silver and traveling in outer space for a weekend outing. We think this optimism almost funny now and wonder where our hover boards are, but our entertainment technology has exploded in a way no one anticipated. Personally, I'm very glad we still wear lots of color. When creating Disneyland, Walt Disney wanted everything to be as accurate as possible. This might seem funny to us who think of it as a land of make believe and fantasy, and to our eyes the rides and audio anamatronics seem outdated and hardly realistic, but at the time even scientists were floored by the sophisticated techniques created by Disney. One of the original Tomorrowland rides was called Flight to the Moon (which later became Mission to Mars,) and the passengers experienced a simluation of what takeoff and space flight would be like. Disney was not content with generic space flight, but insisted that all the stars outside the windows be actual star charts. He consulted with leading scientists, including Wernher von Braun (the only name I recognized in the list, and only because they mention him in the movie October Sky). 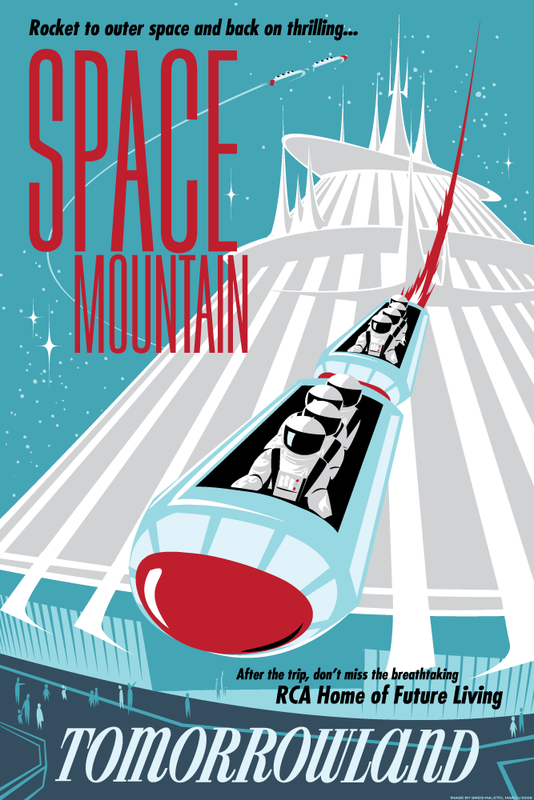 Among some of the most popular attractions today are Star Tours and Space Mountain. Star Tours is hard to explain to someone who's never been on it-your seats move, but you don't actually move, but you feel like you're moving. One of the things I love about Disneyland is that the lines for many of the rides have so much atmosphere. The C3PO pictured above is talking to R2D2, which Disneyland guests can observe as they wait to go on the ride. (Apparantly my mom overheard a guest one year express surprise at the end of the Indiana Jones line because they thought the line itself was the ride.) Space Mountain is a great roller coaster. For those who haven't been back in several years, they've been redoing their old roller coasters to be more smooth and have music that goes along with the rides. I love these vintage posters for Disneyland rides and kind of want to wallpaper my room with them: According to Yesterland, some of the former Tomorrowland rides that did not survive (for obvious reasons) include the Hall of Chemistry, the Hall of Aluminum Fame, and the Bathroom of Tomorrow. One thing that lasted for all of a year but I would seriously love to have gone to was "Fashions and Fabrics Through the Ages." This site has lots of information on Snow White; links to different versions, criticisms, media, and a bibliography. 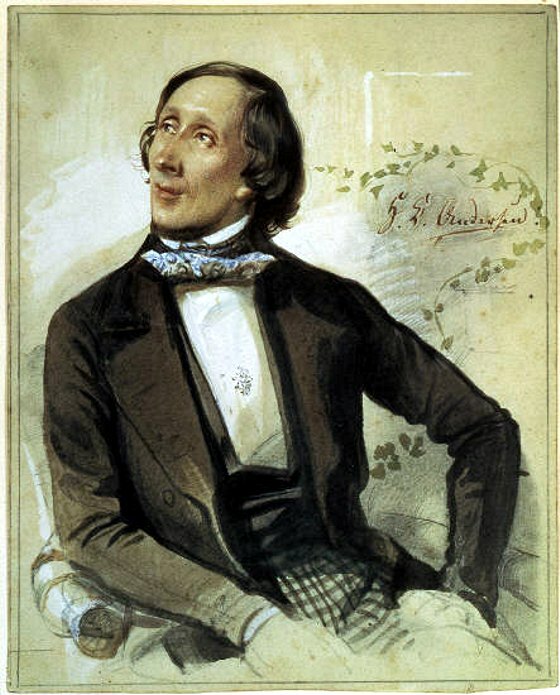 Go here to read a preview of the book Hans Christian Andersen and Music: the Nightingale Revealed, by Anna Harwell Celenza. 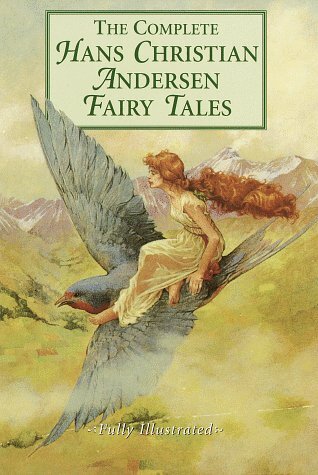 It combines my own two obsessions of music and fairy tales by using the life and writings of Hans Christian Andersen to explore his tastes in music and the musical culture of the time. Andersen started life as a musician (he was a singer until his voice changed) and had a love of music his whole life. Many scholars have suggested that his personal reactions to his early rejections from the theater came out in his fairy tale characters, who are often the underdogs.